A) The continuing to flesh out the transitional cabinet, Venezuelan regional/local official posts, especially regarding humanitarian aid distribution, and internationally, ambassadorships and special reps/envoys. C) A solid consensus plan of ascension/replenishment within the top levels of the Guaido transitional government—within Venezuela’s Constitutional parameters–to fill voids of positions when they happen. Keep in mind that there could be a possibility that Guaido and others at the top of the Guaido transitional government could suffer arrest or be killed or harmed otherwise by Maduro-related forces. If one of them is arrested or killed, then there should be someone credible, responsible and with backing among the Guaido transitional government to step in the void. It cannot be discounted that Maduro may at this moment be trying to put his ducks in order perhaps plotting to do an arrest or “decapitation” operation against Guaido and his transitional government. The United States sent a stern warning to Maduro not to harm Guaido or the Venezuelan people in general. (With no specificity of what that could entail, Maduro and his inner-circle might wonder if that were to include a possible option of a Tomahawk cruise missile strike against them.) As of now, it is unclear publicly what Guaido’s own personal security arrangements are (and they shouldn’t be made public for security reasons). It appears that the greatest protection for Guaido and those around him in his inner circle are the masses of people circling ranks around him. But Guaido, his team members and National Assembly members opposed to Maduro ought to have some sort of security professionals helping them. D) Maduro has declared a blockade against international humanitarian aid coming into Venezuela, and the bridge connecting the Cucuta, Colombia area to Venezuela has been shut off by Maduro forces with a water tanker and heavy containers. Madurista military forces have been reinforced there on the Venezuelan side, while reportedly unpaid volunteers (Venezuelans, Colombians and of other nationalities) are in Cucuta amassing humanitarian supplies. Interim President Guaido tweeted the afternoon of February 11 that a load of humanitarian aid got distributed inside Venezuela to health centers. But Maduro is holding tight to his rhetoric of blocking international humanitarian aid, saying that “we are not beggers” and calling the humanitarian aid a humiliation. Maduro’s vice president Delcy Rodriguez claimed separately at a press conference that the US humanitarian foodstuffs included what she characterized as carcinogens (blue coloring added): “Various scientific studies have shown that this so-called food from the United States aims to poison our population with chemicals. We could say that this humanitarian aid is a biological weapon,” she was quoted as saying by the Reuters news agency. Spokespersons of the United States and other governments scoffed at Rodriguez’s accusation as false and outrageous. On February 12, as massive throngs marched in Venezuela’s capital Caracas demanding that international humanitarian aid be let into the country, President Guaido announced that the Brazilian state of Roraima bordering Venezuela is another collection area for humanitarian aid and that February 23 is a target date for volunteers to form “human corridors” to take food, medicines and other supplies into Venezuela against Maduro’s efforts to block it. A Colombian informal liaison person with Guaido´s supporters in Cucuta told me February 16 that a strategy was to take the humanitarian aid to as many capitals of Venezuelan county-like municipios as possible, starting with those nearest Colombia, such as just across the border from Cucuta in the Venezuelan city San Antonio, the county seat of the municipio Bolivar in Tachira state. The aid could then fan out. In cases like this (and one could presume it would already be happening to some degree), Guaido government reps and/or humanitarian workers could try to talk with the Maduro local officials, making an appeal to their all being Venezuelans and to do the humane thing to let in the humanitarian aid. They could stress to the Maduro local officials that the Maduro local officials would be the “big-hearted persons” (even “heroes”) if they let the humanitarian aid into Venezuela. As the United States and Great Britain did with effectiveness in Afghanistan with the “loya jirgas” (“big tent” understandings) among a variety of Afghan tribes–although the situations in Afghanistan and Venezuela are very different–a case of persuasion could be attempted toward Maduro local border forces to allow (either tacitly, turning a “blind eye” or actively) humanitarian aid to come in, citing that so-and-so may be allowing it in, so why not them, too? And stress that the Maduro local forces don’t look good keeping out the aid and could face future consequences for not allowing it in. If Maduro local forces keep blocking the bridge and/or other border crossings, humanitarian aid could be crossed into Venezuela at other stretches of the border where there are no Maduro forces present–air drops could be considered–but security precautions would need to be taken and the Guaido government would need to be kept abreast of the efforts. A Colombian Army colonel told me in Cucuta February 16 that there are plenty of areas away from border check-points where humanitarian aid can be smuggled into Venezuela. But he added that the question is: How would the Venezuelan Armed Forces respond? He said that some Venezuelan military personnel along the border have privately expressed to Colombian military personnel sympathy for the protesters’ desire to let the aid in and recognize that the situation is bad, but that they cannot speak out publicly. E) Venezuelans in refugee communities along borders in Colombia, Brazil or elsewhere could be mobilized into units according to a scale best suited for efficiency–in concert with the Guaido transitional government–to take humanitarian aid into Venezuela. F) Venezuelans should carry out the predominant work of distributing humanitarian aid from staging areas in neighboring countries to the local “assemblies” inside Venezuela being organized by the Guaido transitional government. International aid entities and Guaido-supporting governments–in concert with the Guaido government–could pay as many Venezuelans as they can for this work (it helps to get the economy going, although unpaid volunteerism is welcome). There should be solid supervision and auditing that the operations and funds are being well utilized and not going into wrong hands. G) Humanitarian aid should be clearly marked from where it originated. If the Guaido transitional government is helping in its distribution, there should be a statement saying so. H) There could be consideration by the Guaido transitional government to declare as humanitarian-aid centers areas inside Venezuela identified to be suitable and strategic and to call the international community in to support them. (In the version of my report for US officials, I named some possible places.) 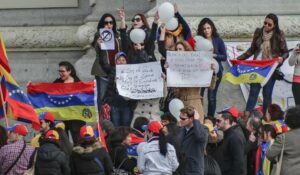 To do this, Guaido’s government would have to coordinate with the international community to have naval, air and ground assets of those countries with sufficient resources–such as the United States, the United Kingdom, France, the Netherlands, Spain, Canada, etc., to assist in ushering in and protecting Guaido government personnel and humanitarian workers. There could be pre-talks with the Maduro local forces so that they do not resist the overwhelming strength of the international/Guaido joint forces. With the first area or two secured and lessons learned, this option could be considered as a model to open other humanitarian hubs on Venezuela territory. These humanitarian centers could also serve as safe havens/points for potential defecting Maduro military units/individuals. I) The Guaido government could engage in strictly governmental transitional talks with Maduro and (separately or together) with the Venezuelan Armed Forces. United States National Security Adviser John Bolton told FOX NEWS February 15 that “the key generals” who support Maduro are already in non-public conversations with the opposition. While Maduro has talked about “finding consensus,” his authoritarian actions, including violent crackdowns, have been criticized as making a mockery of his reconciliatory talk and led the Venezuelan opposition and many in the international community to view Maduro’s offers of dialogue as a cynical ploy to keep himself in power with apparently fruitless endless talks and delays, although Maduro denies that.